An incomplete cast copper alloy pedestal seal matrix, of Medieval date (c. 1250 - c.1350 AD). The seal matrix has a circular die, with a tapering handle. The handle has a hexagonal cross section. The suspension loop is broken. Two raised ridges (collars) are present just below the suspension loop on the handle. There are no marks on either of the six sides to aid orientation during use. The die depicts four leaves arranged in an quatrefoil design, surrounded by the legend around the edge. The legend is not easily legible. The seal matrix is a dark green colour, with an even surface patina present. Traces of tinning are present on the surface. Some of the edges demonstrate a minor degree of abrasion, resulting in the illegibility of the inscription and roughening around the edges. The seal matrix measures 20.06mm tall, 16.51mm diameter at the base and the top of the stem measures 6.19mm wide by 4.65mm thick. It weighs 7.3 grams. Several seal matrixes with similar devices have been recorded on the PAS database (SOM-43EF75 from Cheddon Fitzpaine, Somerset, IOW-EC7B04 from Shorwell, Isle of Wight, NMS-57C805 from Acle, Norfolk, IHS-54B227 from Kingston Upon Hull, WMID-32C463 from Sheriffhales, Shropshire, IHS-550641 from Kent and IHS-54D741 from Kilham, Yorkshire. All have the same inscription surrounding four beech leaves, joined at the stem and arranged in a quartefoil pattern. The inscription is typically *LEL AMI AVET (French: I have a loyal friend). Mrs Irene Szymanski has made the following comments on a seal matrix from Humberside which has a similar device and inscription: "Legend's meaning refers to friendship in the sense of a relationship between the sexes rather than a platonic friendship, an alternative translation for "ami" in this context would be "lover", although this does not necessarily imply a physical relationship - the word does not have an exact modern counterpart. The system upon which this legend draws was known as "courtly love" (amour courtois), and as its name implies, it was love as befitting those of the court. 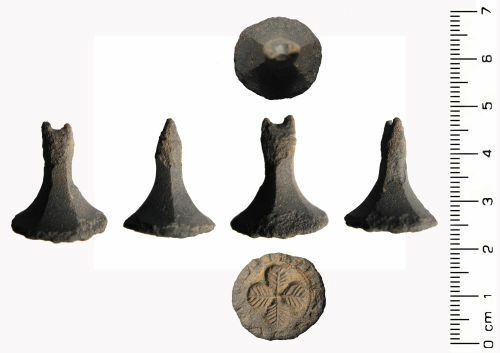 The ethos permeated society in the 12th-14th centuries; although often thought of as a literary phenomenon, there is evidence for it in such items as seal matrices. The reality of mediaeval marriages amongst those who frequented mediaeval royal courts was that marriage was a business transaction, arranged to maximize the financial and territorial benefits accruing to the parties involved. Children could be "married" well before their teens (but did not live together as man and wife until much later) and it was not uncommon for young girls to marry mature men, for unless a boy was the oldest son, he had to make his mark in the world and accumulate some wealth before marriage. Emotional attachment was rarely involved, and the couple had little voice in the matter. Against this background, the system of courtly love developed. This was based entirely on choice; a man and woman would become "lovers" because they were attracted to each other. The relationship was a romantic one in the modern sense; gifts, poems and the like were exchanged, and the lovers expressed undying loyalty to each other. The ruler of this relationship was the woman, a displeased glance from her could cast the male into extremes of despair. On occasions, such relationships must have lead to a few unwanted children, but on the whole, they were effectively a social game. This matrix fits squarely within this context; the legend is an expression of the love and loyalty a "courtly lover" would offer his beloved".